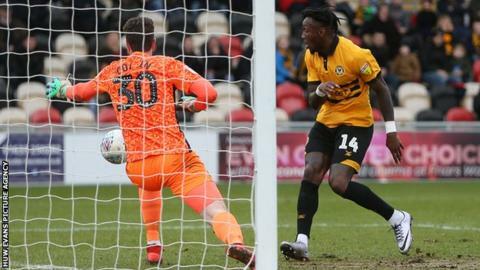 Newport kept alive their remote chances of reaching the League Two play-off berths with a 2-0 win over Carlisle. The Exiles went ahead in the first half thanks to Ade Azeez scoring his first goal for Newport from a set-piece. The result was made safe by Padraig Amond's 21st goal of the season as he pounced on Josh Sheehan's clever cross. Carlisle were lively throughout but were denied by Newport's impressive goalkeeper Joe Day, most notably when he saved Danny Grainger's late penalty. Newport rise to 12th, five points off the play-offs with a game in hand, while Carlisle drop to ninth, a point off the top seven. "I thought we were brilliant today. "In the first half Carlisle created one or two chances, from our mistakes, but they are not a bad team, they play good football. "So it is a very important win, my first against Carlisle as a manager."